Welcome to the website for the Australasian Region of the International Biometric Society. Breaking news! Our most recent regional Newsletter is out now and is also found here. Breaking news! 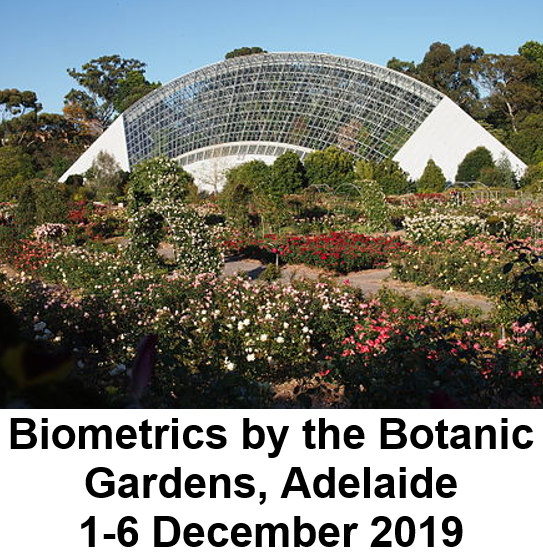 The preparation is well under way for the next Australasian regional meeting, Biometrics by the Botanic Gardens, during 1-6 December 2019 with seven workshops on either Sunday or Monday, 1-2 December. Biometrics by the Botanic Gardens will include statistics research and applications in medicine and public health, agriculture and environment, genetics, natural sciences and education. The list of speakers is: Marti Anderson, Daniela Bustos-Korts, James Carpenter, Claudia Czado, Joanne De Faveri, Max Moldovan, Blair Robertson and Christopher Wikle. More details are in this page. will take place at the Gold Coast Convention and Exhibition Centre during 6-10 July 2020. You can read more about our past and future and other conferences here.